HomeWhy Invest in Staff Development? It’s always difficult to spend money out of too-tight budgets, so why should you consider investing in staff development? After all, it costs money and takes away from working time. Today we’ve compiled a list for you on why staff development is worth it for your company – including in your pocketbook. By offering PMP training to your employees, you should see improved performance. Whether or not the trained employees are actively managing projects themselves, they’ll have a better understanding of what goes into project management. Having your team be on the same page improves efficiency and consistency in results. You can also address weaknesses in performance by offering targeted training to employees who are in need. Here’s where project management training – or any investment in staff development – will really have an impact on your bottom line. When advancement and training are lacking, employees can get bored. Bored employees are unhappy employees, and unhappy employees leave! Coping with turnover by hiring and training new staff represents a significant investment on the part of your organization. Anything you can do to increase satisfaction and morale will benefit you. Training offers your employees a chance to feel invested in and cared about, which in turn makes them invest more effort and loyalty in the company. 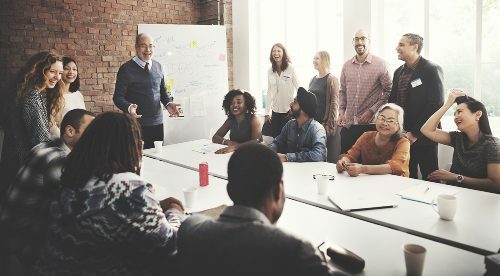 Offering development and training opportunities will not only increase satisfaction among current employees, it will raise your reputation as an organization. That means that when you do need to hire, you’ll attract new employees who are interested in self-development. These are the type of people you need on your team: those always seeking to add more value to their work and are dedicated hard workers. Raising your reputation will attract strong applicants to any new position openings. Offering staff development opportunities forces your organization to consider what future directions it’s going to take. You’ll want to be strategic in the development and training so you invest in the employees you’ll want to promote from within in the future. It also requires you to anticipate future staffing needs and potential industry changes.